Forum Index > Off-topic Talk > Longship/Lundemo Silvia,How good a cutter? Posted: Fri 29 May, 2015 3:58 pm Post subject: Longship/Lundemo Silvia,How good a cutter? Here`s a question for owners of the Longship Line Silvia,by John Lundemo. How good a cutter are they? How do they handle? Are they well balanced?Any info would be appreciated. Posted: Mon 01 Jun, 2015 5:26 am Post subject: Longship/Lundemo Silvia, how good a cutter? I myself haven´t held and tried this ´weird-looking´ sword yet. Posted: Mon 01 Jun, 2015 5:31 am Post subject: Re: Longship/Lundemo Silvia,How good a cutter? Well, I haven't tried the Silvia myself but my favourite DS were Longship John Lundemo made. I also have plenty designs that were made by him. All of them cut EXTREMELY well. You can goto my youtube and check my test cuts video. I have a friend who has got 2 Silvia, using them all for cutting practice. So you guess how good they are that someone has to buy 2. So you got a good idea how well his stuff will perform. Silvia is one of the swords that I would not hesitate to buy to be used in my style. As of Silvia being weird shaped. I dun think so. 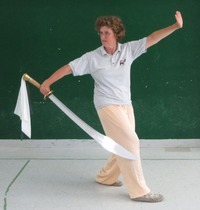 Chinese bagua dao is of very similar shape. That's why the Silvia would work in my hands. Here are 2 reviews and test cutting.